At your request, we will send you our brochures and special promotions or offers. Our e-Specials are promotional emails about special offers, attractions and events happening in and around Kure Beach, North Carolina. You will receive approximately six e-Specials a year. You can unsubscribe at any time, directly from the prominent links within each e-Special, by telephone at 1-877-406-2356, or by emailing us at visit@wilmingtonandbeaches.com with "Remove from your mailing list" in the subject line. We do not share our email lists with anyone. 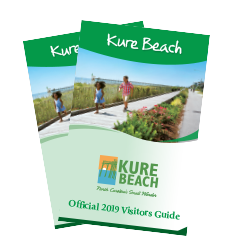 As discussed above, you can always choose not to provide information, even though it might be needed to take advantage of CVB services, or to receive more information about Kure Beach.